Coming up, I want to share a really cool case study that we just implemented that helped a client go from 166 to number 2 for their most desired keyword, and I will show you the impact on downloads. Stay tuned. What is up app nation? It is Steve P. Young, founder of appmasters.com. 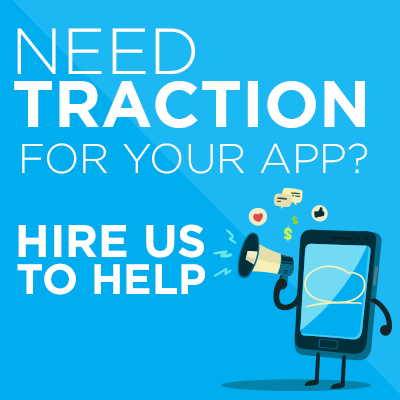 The place you go when you want action packed app marketing content, because I reveal a lot of stuff and things that are working in today’s app environment. Today in this video, I want to share with you a ASO case study, a few ASO case studies, actually, that we’ve been running. It’s a brand new campaign that we just started implementing. I think it’s been around for a little bit, but the results that we’ve been able to achieve have been phenomenal. So, it’s a brand new campaign that I’m calling a search boost campaign. This is when we get people to search for your keyword, and download your app. It’s part of the keyword ranking algorithm. Because people are searching for a particular keyword, and downloading your app, the relevancy score of that particular keyword to your app increases, so helping you rank better for that particular keyword. Okay? Just so you understand what this campaign is all about. I’m going to share with you three different case studies, and then share with you the impact on downloads that I was able to pull for one of those case studies as well. Here we go. This is the search boost campaign. Here’s case study number one. This is for a client. I’m gonna hide the client data. I’m gonna hide the keywords, because this is sort of still a black hat ASO strategy, so I don’t want anybody kind of figuring this out, so I’m hiding all that stuff. But this is a client that was 166, and went to number 2 for his particular keyword. Here is the data. I want to highlight that this works, for even really competitive keywords. The keyword that we’re targeting, this is the data from Mobile Action and Sensor Tower. As you can see, Mobile Action says the chance that you’re going to rank really high for this keyword is really low. 37%. On Sensor Tower, Sensor Tower is saying this keyword has a 4.7 traffic score, which is really good on a scale of 10. But, a 4.6 difficulty, so a really difficult keyword. We’re able to get it from 166 to 2. Frankly, I didn’t know if we would be able to do it, but I’m certainly happy that we were able to achieve this level of success. Client B, client number two. This is another app. These are all different categories, by the way. Client B, we went from 39 to number one, and we stuck there for about eight or nine days. Right? Same thing. This was the first test that I wanted to run on, actually. So, this was a client of ours. He hired us for a bigger package, and I said, hey you know what? You’re ranking this for particular keyword. This was a broad keyword. I said, can I try this campaign for your app, because you’re probably like, you’re 39 right now, 34, and I want to see how low we can go to get it to number one. So, that was the first test I actually ran it on, for a client who just signed up for a different package, but I wanted to see if this campaign would work, because we’re starting at a really low point. A lot of times, when I run this campaign, it is generally for apps that were ranking in the 11 range, and then we get it to number one. Never this far low at 39, and then the next client was 166. The fact that we’re able to hit, get it in the top five, really phenomenal stuff. So we were able to get that to number one. Here’s the last client. This client, we had two keywords. Again, signed up for a different package, but I wanted to try this campaign on his app as well. We picked two keywords and we ran the campaign. We got it to number one. One of the keywords, we started at 43. The other one was 11, and we got both of them to number one within a couple of days. I know some of the questions people that people are asking were like, how many downloads did that take for you to actually get to that number one position. It’s going to really depend on the keywords, but I would say anywhere from 500 to 1,000 a day will get you there, using the search boost campaign. All right. I know what you’re thinking. All right, cool, Steve, I like that you’re ranking number one for them, but what about the downloads, dude? What kind of impact did it make, from being number one, what kind of downloads did you see? So, I’m going to share this data for you again. No client data. Everything’s taken out of, but I’m gonna share some key things for you. This is a client that we’ve been helping out a lot on, and we’ve been running their search ads campaign, and seeing some really good success there. I want you to kind of have these, while you’re looking at this video, I want you to think about this. So, the search ads started, and that’s why you see the little bit of bump in downloads. Then here’s where the search boost started as well. The key dates that we’re actually number one on were from January 14th to the 17th, so really fresh. Right? Those are the key dates. The search boosts, again, we’re sort of putting those downloads in, and that’s why we’re able to rank number one, so I’m not gonna count those downloads. I’m only gonna count the downloads when we stopped running our campaign, and now we’re just number one on for those two keywords. So, here’s what happened. I’m gonna compare the data, the four days. Week over week data. Okay? The 14th through the 17th, and then I’m gonna prepare it to the previous week, when we had search ads going as well. The 7th to the 10th, and then I’m gonna compare it to two weeks before that, when there was no search ads campaign running at full blast. All right? Here’s the impact. We saw 60% increase in downloads versus search ads. When we compare week over week, when we had the search ads campaign running at the same time, because we were number one for those days, we saw 60% increase in downloads during those key days. When you’re comparing those four days versus the week before. We saw a close to 300% increase in downloads, when we’re comparing it to two weeks before, when there’s hardly any search ads campaign running. So, just all organic downloads. You can see a humongous push in terms of downloads by being in the number one position, because of this search boost campaign. 300% increase in downloads just by being number one for these keywords. Now, these keywords had really good traffic scores, obviously, so the fact that we’re able to achieve number one for this keyword, really 300% increase in downloads because of it. You can see sort of the downloads on here as well. Phenomenal stuff. Something that I’m really excited about, as we’re working on this. Now, the downside, because I want to be completely transparent with everybody is that it doesn’t always last. So, as you can see, I’m going to go back a couple of screens here, we got it to number one and now it’s starting to taper off. The end goal is obviously to get you to rank better. This keyword went from 43, hopefully it will settle in at maybe 11, or 15. Then the 11 keyword, hopefully that will settle in to 5 or 6. It does start dropping off after a while, but the days that you are number one, you see a tremendous amount of increase in downloads. When you start dropping off, I want to make sure it’s higher than when you first started. You know, a couple of points higher. Then, we’re trying a bunch of different hacks to try to get you to stay in maybe like the top three position. I don’t know if I can get you to stay in the top one position, but I’m going to try a couple of different hacks to get you to stay in the top five position, and not fall off as much. That’s a downside. You do start falling off after a while. If you continually inject it, these are just more like one day type of campaigns, but if you continually do it, if you have the budget for it, is what I want to test. For those who have the budget for it, how do you … can you continually run this on a 30 day cycle and let’s see what the end result is? I definitely want to test it out for all of these different things, and more of the NG side as well. How do you do this, and make it stay? Right? So there’s a bunch of different things I want to test out, and I’ll kind of report back to you on what’s happening, but this is a cool search boost campaign. If you’re interested in working together on this, let me know. Just reach out to me. There are other services out there that do provide this campaign, so I’m not the only one. Just want you guys to know that, but if you are interested in working together, please email me and we’ll kind of figure out how to run this. If you’re open to it, I’d love to run different hypotheses. Make you a case study as well. Different hypotheses on how we can make you stick longer than just like the four, or seven, or eight days that you’re on the top. Hope you enjoyed it. Let me know in the comments what you think. I look forward to seeing you on the next video. Bye.